1.Place flour, ¼ cup almond meal and butter in a food processor and pulse until mixture resembles breadcrumbs. Add water and blend until pastry just comes together. 2. Roll out dough into a 33cm circle and transfer to a lined baking tray. 3. Combine egg whites, remaining almond meal and Ricotta, spread evenly over base of pastry, leaving a 5cm border. Arrange strawberries over ricotta layer and lightly brush with butter. 4. 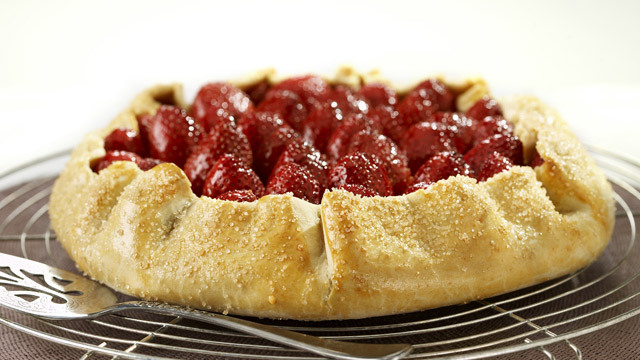 Turn overhanging pastry over the strawberries and crimp decoratively. Brush with egg yolk and sprinkle with raw sugar. Bake at 200°C for 30-35 minutes or until golden. Serve warm with ice cream. This entry was posted on September 3, 2010 at 7:44 am and is filed under Cooking, Family, Friends, Random, Recipe. You can follow any responses to this entry through the RSS 2.0 feed. You can leave a response, or trackback from your own site. Oh..my this looks wonderful…even though it’s going to be hot here tomorrow…I think I shall be baking…thanks! Oh, yum, this had my mouth watering. How delicious. Thank you for posting. super cute and tickling post. This looks so delicious..I think.. I am going to try this at home.. Do you have a substitute for eggs..
Condensed milk is a good substitute for eggs. Use a half-tin condensed milk for every 2.5 cups of flour used in the recipebut in this instance it will be too sweet. Looks delicious! I should go buy one. Ha! I’ve been so busy with difficulties lately that I don’t have time to do the things I might like to do if I had time to think of what I’d rather be doing. Now I know what I’d like to be eating. Tsk tsk. I’ll never be skinny. Love to you and thank you for inspiring me again.